This quote for me sums of my experience of B.O.M. I have loved wearing Gillian’s wonderful metallic piece. This eruption of silver that, when worn constantly on my jacket makes its own special sound. Such pieces as these are possibly seen as ‘wearable sculpture’. 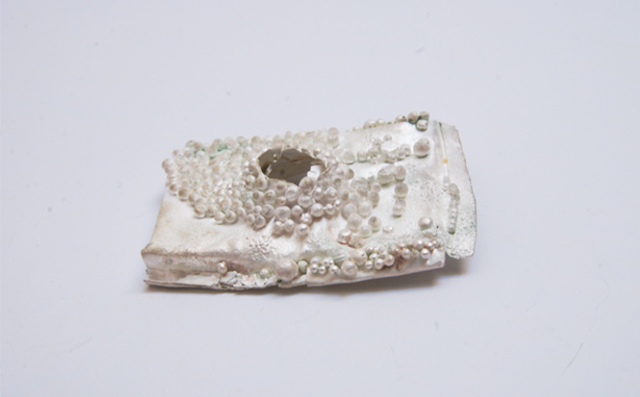 Wearing this brooch reminded me of the work of Len Castle. The resonance of his work and references to the volcanic areas of the central North Island. I can see linkages in both artist’s practice. For me, the brooch could function as a ‘found object’ as a bit of the real that has been imported into the making process. Maybe an ‘imitation’ of the real thing. However its elegance makes this piece very unique. The brooch has many admiring comments and looks particularly shining on black. It has both impact and its own delicate nature. I’m completely sold on this beauty.